This article in MyWikiBiz Main article space is published with "all rights reserved" by the component contributor(s) to the article. You must obtain express written permission to copy or re-use this article. The consumer economy is that portion of the overall economic system that is dependent on individual or household consumer expenditures. Thus, the consumer economy is distinct from (yet related to) the industrial economy which emphasizes trade between corporations (investment banking, industrial machinery, chemicals, etc. ), and the public sector which involves the delivery of governmental services (bridges and roads, sewers, public education, entitlements, armed forces, etc.). When the economy of a nation is described as a consumer economy (sometimes consumer-based economy or consumer society), this implies that the nation's prosperity is significantly based in sustainable consumer demand for goods and services. Generally, such goods and services are obtained through exchange and not through self-production. Economists have suggested that, in a consumer economy, the concept of "enough, or more than enough" is undermined; the demand for goods and services, and the availability of income to purchase them, is assumed to be constant. The result is a close relationship between employment and income from employment on the one hand, and production of goods and services on the other. It has been said that "(a) consumerist society is one in which the possession of an increasing number and variety of goods and services is the highest cultural aspiration and the surest perceived route to personal happiness, social status, and national success." The consumer economy began to expand exponentially in the early- to mid-20th century. Around the early 20th century, the growth of consumer rights and activist movements also commenced, with the creation of organizations such as the National Consumers League. It has been said that two-thirds of jobs in the United States are now tied either directly or indirectly to the consumer economy. 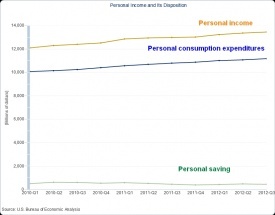 Additionally, consumer spending in the United States amounts to about 70% of GDP. Such a reliance on one aspect of the overall economy has its own set of risks. Herman van der Wee argues that the dramatic growth in the consumer market that grew exponentially in the latter half of the 20th century has its origins in the changing socioeconomic objectives of US, Western European countries and Japan in the aftermath of World War II when economic prosperity became central to government coordination. He argues that these governments constructed the modern consumer economy by powerfully facilitating a growth in demand. This was directly achieved with increasing wages and giving employees a surplus beyond the basic costs of living which gave people a growing capacity to indulge in leisure, tourism, fashion and personal transport. As a result, the demand for consumer goods grew, and investment in the private sector thus increased, generating new jobs to meet the growing consumer demand. This in turn had the knock-on effect of increasing the size of the consumer market by employing new people who in turn would have enough money to spend on goods and the economy would continue to grow at an exponential rate. In the 1980s, an easy-money system contributed to a marked boom in the consumer economy, which continued throughout the 1990s and early 2000s until the on-going financial crisis of the latter part of the 2000s. Professor Peter Spencer of the Ernst & Young ITEM Club concluded that the consumer economy in the United Kingdom would not recover from the late-2008 recession until 2011. Ann Kramer, in turn, has proposed a new economic system as an alternative to a consumer-based economy, due to the effects of the recent recession. Dubbed "Partnerism", the proposed economic framework would implement equal cooperation between all sectors of the economy, elevating the significance of what the author perceives as marginalized sectors. Kramer believes that the 2008 bailout of financial institutions in the United States was not a sustainable model, commenting that "Wall Street has been acting like drunken fools". Borrowing by US consumers in the 2008 to 2011 period fell markedly with rising unemployment exceeding 10%, and consumer credit availability falling by 10%, in excess of five times what economists had predicted. ^ Jerome Segal, "Alternatives to Mass Consumption" Philosophy and Public Affairs 15:4, 1995, pages 27 to 29. ^ Introduction to Prosperity and Thrift, from Prosperity and Thrift: The Coolidge Era and the Consumer Economy, 1921-1929, Library of Congress. ^ The Support Economy: Why Corporations Are Failing Individuals and The Next Episode of Capitalism, Shoshana Zuboff & James Maxmin, pg. 8. ^ Big Spenders: The Consumer Economy, The New York Times, Catherine Rampell, May 3, 2010. ^ Stronger Consumer Spending Boosts U.S. Growth, Associated Press, January 28, 2011. ^ Wallop, Henry & Conway, Edmund (2008). "Consumer economy will not recover until 2011". The Telegraph, telegraph.co.uk. This page was last modified on 3 December 2013, at 17:33.